"How to Become An Expert Solar Imager"
This is another of those resources that are difficult to find to order online, and that is presently not sold by any other store in the Americas. Company Seven found this video insightful, particularly for those who may just getting started into imaging the Sun; those who are already taking good images may produce even better results after studying this tutorial. Company Seven makes a special effort to stock this DVD at our showroom, we make it available to those in the Americas who cannot visit our showroom through our on line ordering 'Buy It Now' below. The Sun has been a subject of awe, respect and worship, fear and study since the dawn of time. Early astronomers too wondered at it, and many were blinded (including Galileo) by employing unsafe filtering techniques to look directly at the Sun; these methods attenuated the brightness of the Sun but failed to filter out the then misunderstood damaging infrared and ultraviolet rays. It is only over the recent generations that mankind has developed the technology to reveal the Sun with complete safety, and to capture images of it in all its magnificent diversity. 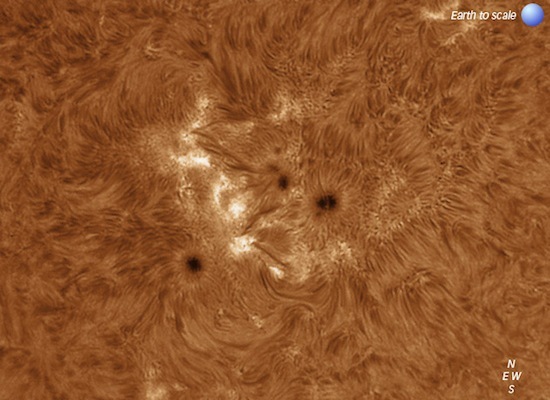 Right: another simply stunning solar image taken by a Solarscope DSF-70 filter configured for 0.5Å operation attached to a TeleVue 76 telescope (70,502 bytes). 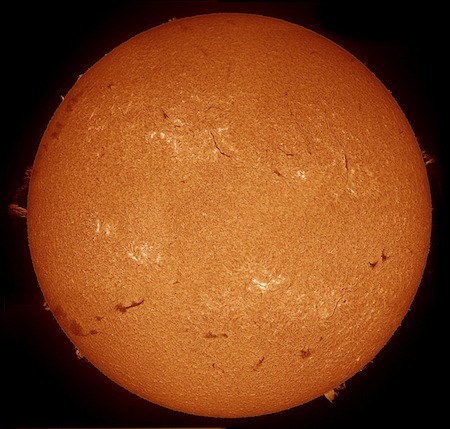 Photos cannot convey the 3-D like qualities of the Sun observed through a filtered telescope by the eye, but the image by Pete Lawrence for Solarscope is nonetheless stunning. Click on image to see enlarged view (418,507 byes). "My sun sets to raise again." "The earth has received the embrace of the sun and we shall see the results of that love." "Finally we shall place the Sun himself at the centre of the Universe." "Is it so small a thing To have enjoyed the sun, To have lived light in the spring, To have loved, to have thought, to have done." Matthew Arnold, 'Empedocles on Etna', act 1, scene 2, l.397^400. "Education is another sun to the educated." Heraclitus, fl. c. 500, Fragment quoted in H Diels and W Kranz (eds) Die Fragmente der Vorsokratiker, vol.1 (1951), 181, no.134. "One evening, I was walking along a path, the city was on one side and the fjord below. I felt tired and ill. I stopped and looked out over the fjord, the sun was setting and the clouds turning blood red. I sensed a scream passing through nature; it seemed to me that I heard the scream. I painted this picture, painted the clouds as actual blood. The color shrieked. This became The Scream." "If I had to choose a religion, the sun as the universal giver of life would be my God." The materials within the DVD How to Become An Expert Solar Imager will teach you how to not only capture images of the Sun but it also provides instruction about how to process images, just like the professionals do, to colorize monochromatic images, to achieve a dramatic result, or clarify subtle details. So with the proper equipment and this instruction you too can experience the Sun and produce amazing results: the Sun can be your object of study or of art. 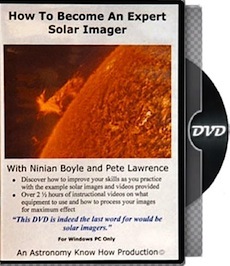 This instructional DVD resulted from a collaborative effort by Ninian Boyle and Pete Lawrence, two experienced amateurs who are using solar filtered telescopes the same as those you can buy from Company Seven. They produced this DVD to answer these questions and many more besides. Their work has featured prominently in works by the BBC (British Broadcasting Corporation) as well as in advertisements for companies that manufacture equipment for amateurs and professionals including Coronado and Solarscope, Ltd. for example. 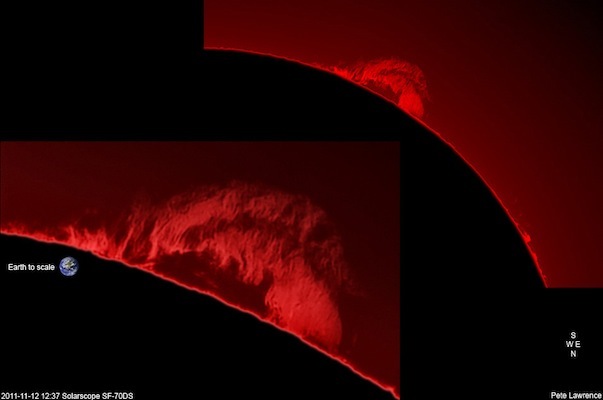 Pete Lawrence is one of the worlds best solar imagers and has had many of his images published in magazines and on the Internet. He is a co-presenter of the BBC television production Sky at Night (formerly with the late great Sir Patrick Moore), and Pete is a major contributor to the BBC "Sky at Night Magazine". His images are studied and appreciated right around the globe and in the course â€˜How to Become and Expert Solar Imagerâ€™ he parts with, until now, closely guarded secrets as to his techniques for obtaining these truly remarkable images. 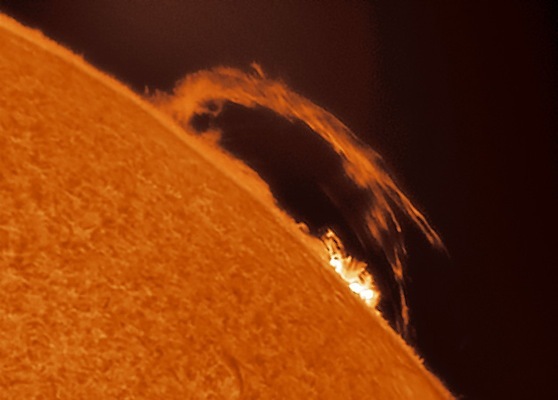 If you have browsed astronomy images on the Internet you will likely have come across his was as his work has been selected many times as the NASA Astronomy Picture of the Day (APOD), and regularly has his solar images published on 'Space Weather.com'. 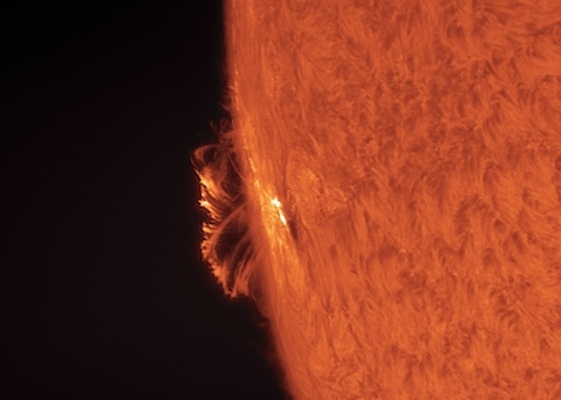 You will find several of Pete's solar images at Company Seven's web site too as examples of what can be accomplished with the superb Solarscope, Ltd. hydrogen-alpha (Hå) filters. Right: Pete Lawrence (11,744 bytes). The co-author Ninian Boyle is an experienced astronomer and astronomy educator, and he is a contributor to Astronomy Now Magazine and to other astronomy periodicals. His speciality is in astronomical equipment. He operated the telescope dealership 'Venturescope' for fifteen (15) years, and has experience is setting up and installing astronomical observatories. He devotes his time to bringing the astronomy to a wider audience through educational works including lectures and teaching in Planetariums and at the regional astronomy societies. He wants to encourage others in what he describes as the "best hobby in the world". He remains an avid astronomer, preferring nothing more than observing and imaging the Sun from his own observatory on the south coast of England. 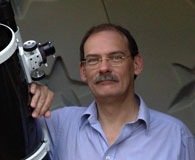 Mr. Boyle is a Fellow of the Royal Astronomical Society, and a member of the British Astronomical Association. ...well we can show what equipment you need and how you can produce images to be proud of, all in plain simple English." Right: Ninian Boyle (11,744 bytes). As a side note, that is the Queen's english for the rest of us. So how can you take a picture of the Sun? Above image: The Sun by Pete Lawrence, image taken on 2 June 2010 with a Solarspectrum SF-70 'Double Stack' Hydrogen-alpha filtered telescope (146,699 bytes). Click on image to see enlarged view (146,699 bytes). The content of this DVD is based on a course originally put together by Ninian and Pete for a program at a planetarium in southern England. This presentation was so well receive and met such a fantastic reception on the day, with many other people wanting to attend but who could not owing to distance and or scheduling issues, that Ninian and Peter decided to turn the content of that presentation into a video product that could be sent out to desperate and confused would be solar imagers. In fact they have produced what many believe to be the ultimate course on Solar Imaging, that will give you all the information that you need, from what equipment you can use and how to set it up, right through to acquiring the images and then the final processing to give you results that you can be proud to show the world! More than two and one-half (2-½) hours of instructional video covering topics including what to use, how to capture images, and the final post-processing of the image data to produce stunning pictures. FREE image processing software*: all that you'll need to commence processing and finalizing your images. This alone can save you hours trawling the Internet to accumulate these resources. unprocessed images and videos supplied by Pete so that you may practice processing; you can make your mistakes in safety! 1. This DVD contains not only the instructional video but also the software (PC Windows operating systems only) and practice files. So while you can see the images and video content on a Windows or Macintosh computer, the image processing software is compatible only with PC Windows operating systems, or a Macintosh computer that also has a Windows operating system running through Apple Boot Camp or Parallels for example. This DVD is not authored to be read by a conventional DVD player, instead it can only be read with a personal computer. 2. We find that Apple and Windows based computers are notoriously inept at playing back the many encoded forms of video files that are out there. So most of us at Company Seven have installed several freeware third party players that do much better. So if your PC with standard software has difficulty playing back the audio or video then you should install some freeware player for Windows such as Easy Media Player from download-free.com, or VLC media player by the VideoLAN Team. 22 Sep 2011 at 12:06:21 GMT (72,303 bytes). 29 Aug 2011 at 11:57:15 GMT (46,145 bytes). DSF-70 Filter 22 Sep 2011 at 12:06:21 GMT (78,871 bytes). 12 Nov 2011 at 12:19:39 GMT (30,706 bytes). Ninian managed to persuade Pete to part with some of his image processing secrets. So for the first time ever, Pete has agreed to have some truly remarkable techniques that he uses available to you. In fact one of these techniques is nothing short of revolutionary! As this DVD first came into limited distribution in the United Kingdom several customers suggested that a charge of £100 (Approx. $150 USD) for all this information. However, Nigel and Pete would like you to benefit from all this valuable information at a price that most people can afford, so they decided to market the DVD, complete with the included software, all for just £39.95 plus the postage and packing for delivery within the UK of £5.95. Company Seven offers the DVD with postage to most customers in the Americas for under $70.00. Full 6 Months Money Back Guarantee! Please note again, this DVD is formatted for use on a Windows PC ONLY (the software provided is for PCs and because there are practice files for you to use as well as the software, the DVD will not run on anything else) and this is currently not for sale outside the UK by other authorized distributors. • This DVD is not Region-coded so it can be played by any personal computer world-wide, but owing to the software and other files content this cannot be read on a conventional DVD movie player. • You will in the future be able to order the revised edition here by PayPal, or simply contact Company Seven the old-fashioned ways, or send E-Mail to request ordering advice or a PayPal Invoice when the revised DVD becomes available. • The prices listed here will include the DVD and this also includes delivery by Priority Air Mail. For customers overseas we send by International Priority Air Mail, so please allow between about six (6) to ten (10) business days for delivery. WHEN THIS IS AVAILABLE AGAIN then you will be able to click on the Buy Now button above to order on-line. Or visit our Laurel, Maryland showroom to pick up your DVD.